This myth-busting article originally appeared in the spring issue of Soybean Business, a publication of the Minnesota Soybean Growers Association. It is re-published online with permission. Photos and captions added by ETS. Farmers are always on the lookout for ways to increase profitability while protecting their soil and water. One option many farmers have implemented and others are considering is some form of reduced or conservation tillage. Because incorporating practices like strip-tillage into a farming operation may involve a significant shift away from how they’re currently operating, farmers can be hesitant to make the switch. Proponents of strip-tillage say the practice can be just as productive as conventional tillage, but also conserves soil resources while saving time and money because tillage, fertilization and planting all take place in a single pass. 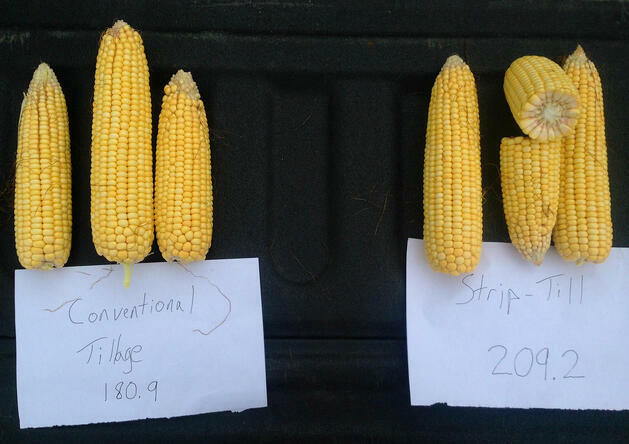 Here are some common misconceptions about strip-till farming. Myth: I risk getting reduced yields if I don’t use conventional tillage. Truth: Multiple on-farm and university studies throughout Minnesota and the Midwest have shown that strip-till farming consistently produces higher corn and soybean yields than no-till, and equal to those of conventional tillage. Because strip-tillage involves different equipment and management, farmers can sometimes have a difficult time finding other farmers from whom they can learn. The University of Minnesota puts on an *annual conservation tillage conference and tillage field days to help farmers learn more about tillage options and how they impact farm productivity. This photo, taken by Plains Grain & Agronomy (North Dakota), illustrates that yields with strip-till can be even better than conventional. Myth: My soils won’t warm as quickly in the spring with strip-tillage. Truth: Even though only narrow strips of ground are tilled, multiple years of research from multiple Minnesota locations shows that spring soil temperatures are essentially the same in the tilled zones as they are in conventionally tilled fields. Temperatures are cooler in the untilled zones, but that has little or no impact on seed germination. Example of seed germination in an Iowa field. The added residue also helps control moisture and erosion. Myth: I tried it years ago and it doesn’t work for me. Truth: Some farmers did try strip-till farming decades ago and struggled to make it work. As with many things in agriculture, advances have been made to equipment and guidance systems since then. “Technology has definitely changed the [agriculture] game,” DeJong-Hughes adds. Manufacturers have improved their equipment technology and RTK guidance systems have advanced, adding another level of precision. Strip-tillage may not be for every farmer, but tools and technology are improving to make it a viable option for many. An RTK subscription is essential for staying on the zone during fall and/or spring tillage. Use VRT to apply the right amount of fertilizer per acre. Myth: The equipment I need is too expensive. Truth: As with most pieces of farm equipment, there is a significant investment involved to purchase strip-till equipment. However, converting to strip-tillage does make multiple implements obsolete. Because tillage, fertilization and planting takes place all at once, farmers would no longer need all of their current tillage equipment. Farmers use the same piece of equipment if they choose to do fall tillage. “No one wants to get rid of traditional equipment until they’re sold on another practice,” says DeJong-Hughes. “But when someone believes in it, they’re more willing to pay for what they need.” DeJong-Hughes says some manufacturers will work with farmers to rent equipment to see if they like it and to see if strip tillage is right for them. Yearly cost savings can also help offset the cost of any equipment. A three-year on-farm study in southwestern Minnesota showed that the farmer who practiced strip-tillage saved about $13.55 per acre compared to disk ripping and chisel plowing. 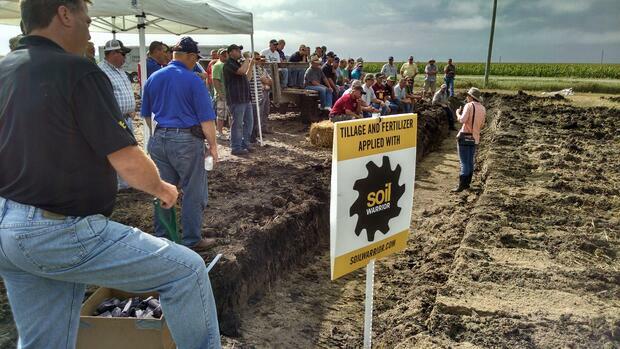 Attending a local tillage field day is a great way to learn about different tillage practices and equipment. Continue learning about strip-tillage and how the SoilWarrior can help you create the ideal seedbed by downloading our free guide.